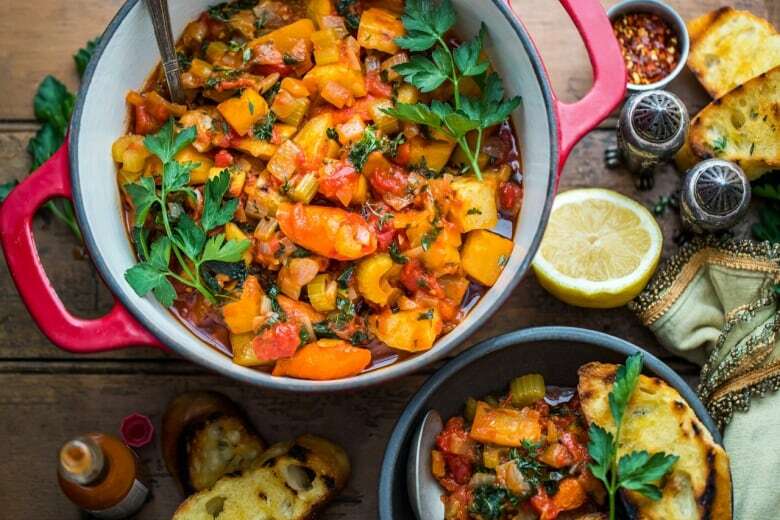 A stew to make on Sunday, enjoy all week or serve to a crowd — oh and it’s vegan too! Garlicky roasted root vegetables in a simmering tomato sauce with kale and crispy grilled baguette. Yes please! 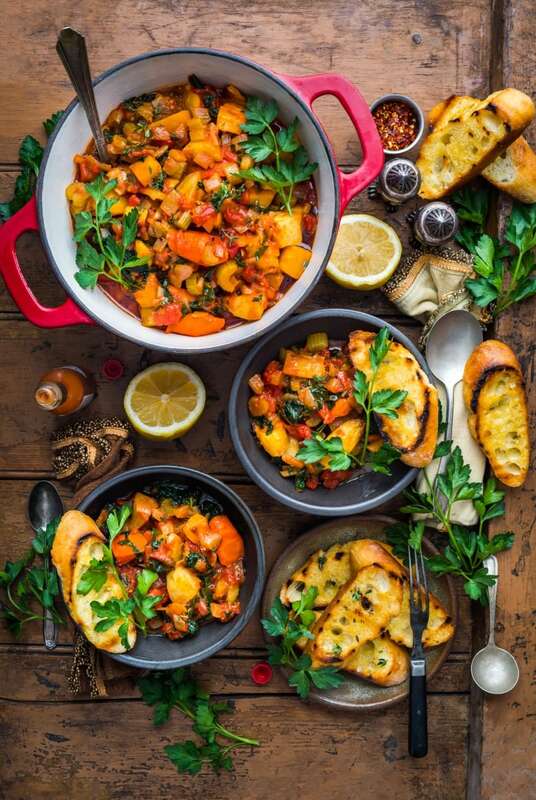 This hearty stew is overflowing with comforting seasonal veggie goodness and the perfect way to warm up during those cold, Canadian winter days. Preheat the oven to 350F degrees. Line a large (or 2 medium) baking sheet with parchment paper. Toss the sliced & diced root vegetables with 3 tablespoons of olive oil, 1 teaspoon of sea salt, ½ teaspoon cracked black pepper, and chopped thyme. Pour onto the prepared baking sheet, then scatter over the garlic cloves. Roast for 1 hour, turning halfway through, until golden brown. Meanwhile, heat a stockpot (or large Dutch oven) over medium-heat and pour in the remaining 3 tablespoons of olive oil. When the oil is hot (but not smoking), add the onion and cook until just softened, 5-6 minutes. Add the tomato paste and cook, stirring often, for 2 minutes, then pour in the tomatoes, stock, oregano, lemon zest, and season with the remaining salt and pepper. Bring to a simmer and cook for 15 minutes. Add in the roasted vegetables plus the garlic and the kale leaves, and simmer for 5 minutes. Give the stew a taste and season with an extra hit of salt and pepper as desired. Heat a grill pan (or cast-iron pan) over medium-heat. Drizzle the sliced baguette with olive oil, then grill until golden brown and toasted beautifully, about 2 minutes per side. As you remove the bread from the pan, immediately rub both sides of each slice with the garlic and rosemary. Divide the stew into serving bowls, garnish with fresh parsley, and serve with the crusty grilled bread. Dennis The Prescott is a chef, cookbook author, and food photographer based in Moncton, New Brunswick. Prescott has amassed a devoted following of almost 500K social media followers, cooks regularly on National television in the US and Canada, and has traveled the globe with World Vision Canada and WFP, cooking from New York to Nairobi. His National bestselling cookbook, Eat Delicious (William Morrow/HarperCollins) was named one of the Globe & Mail’s best cookbooks of 2017. Find more of Dennis’ recipes at dennistheprescott.com, or on social media at @dennistheprescott.